Each morning, throughout the day, and the last thing at night, we watch the surf. When one is visiting Hawaii that is what one should do. Rather than trying to see all of the sights of whatever island I am parked on, I kick back and say, alo-haaaaaaa. 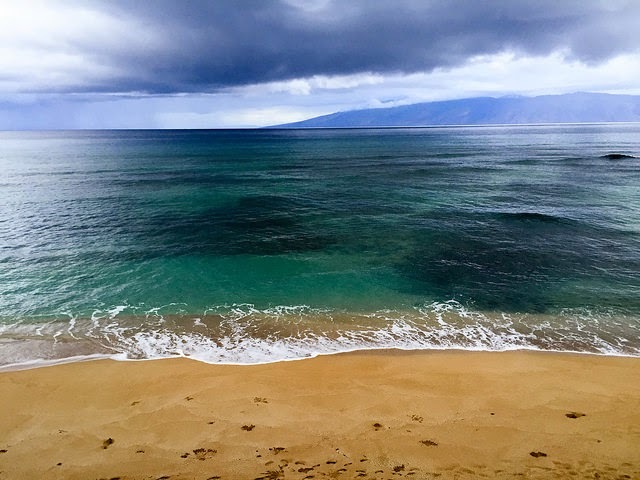 I had been staring at the movement of the water and looking out across to Lanai and Molokai for two weeks. I walked and ran in my adopted neighborhood of West Maui nearly every day. One day I decided to head up, and up away from the beach. When I turned around, I was quite taken by the panoramic view; but moreover, I was surprised at the awe-inspiring perspective of it all. The islands I had been viewing from the beach seemed to have grown. While the sands had been shifting in front of us days earlier creating and taking away beachfront, there was no way those islands grew higher, but here I was looking at what appeared to be much taller islands. After my hill climb, the word perspective kept dancing in my head for days. When a word continually bounces around in my brain, I know I must give some sort of awareness to it. By giving this random word center stage, I allow the awareness to become a point of learning. I allow the word to speak. I know perspective is a way of regarding something. It's a frame of reference that lends to my interpretation. Whether it's a sense of proportion, as in my view across the water, or it's my understanding of the relative importance of something, perspective is my point of view. Viewing the islands from a hilltop, I can see I should allow for the possibility of change in perspective depending on what information I have at the time, depending on how I look at things. Rather than being rigid in my perspective, I must strive to be fluid, like the ebb and flow of the waves I've been watching. This fluidity brings me peace and allows me to see my life, and the world around me, in a more understanding way. It allows me to bring acceptance to whatever comes my way. By allowing the word perspective to speak to me as I stand on the hillside, I hear and see perspective in all things can and does change. Now, if I had been driving all over the place trying to see the sights and do everything I possibly could, I just might have missed this learning opportunity. As I look out of West Maui, beach level or hilltop, I have certainly expanded my horizon. Alo-haaaaaaa. Over the course of a few days, on a recent visit to Maui, Hawaii, we watched the beach move from one location to another. We had a rocky shoreline in front of us when we arrived, then a few days later the entire beach had shifted from a sandy beach condo complex just north of us. We were left with the sandy beach while the resort was left with a ten-foot drop to the volcanic rocks. While I know the ocean and the sand are in a constant state of movement, to see how quickly something like this can happen was simply jaw dropping remarkable. These shifting sands remind me of how fast life can change. One minute all is is well, and you are drifting along happy as a clam, then BAM, the tides change, and everything goes topsy-turvy. Change is often difficult to deal with, even when you can see it coming; but when you don't, well that's a whole different beach altogether. I find the key to change is some form of acceptance. Until I find acceptance, I ponder my choices. As you can see by the pictures, there was no stopping the strong tides and shifting sands, so rather than fighting the tides, I simply float along and see where the tides take me. Even if I can't land where I would like to, where I end up may be even better. Think of it this way - same sand, different beach.